The fiendish Skulker gang has stolen your precious Red Diamond. Now it's up to you to hop in your powerful Drill Dozer robot and lead the Red Dozers on a destruction-filled quest to get it back! Plow through everything in your path! 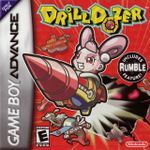 User your devastating Drill Dozer to demolish walls, rooms,furniture, enemies, and anything else that gets in your way! Side-scrolling action! Jump across pits, bore through blocks, and latch on the lifts to reach secret treasures. Beef up your ride! Search the world for hidden gears that'll trick out your Drill Dozer or buy powerful new drill tips, energy tanks, and more at the shop.